The most significant unanticipated costs on many construction projects are the financial impacts associated with delay and disruption to the works. Assessing these, and establishing a causal link from each delay event to its effect, contractual liability and the damages experienced as a direct result of each event, can be difficult and complex. 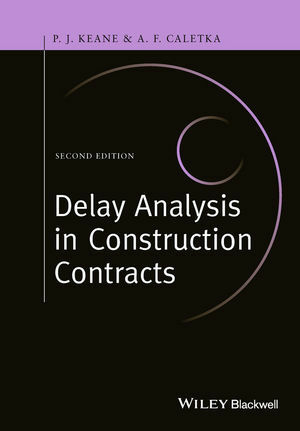 This book is a practical guide to the process of delay analysis and includes an in-depth review of the primary methods of delay analysis, together with the assumptions that underlie the precise calculations required in any quantitative delay analysis. The techniques discussed can be used on projects of any size, under all forms of construction contract, both domestic and international. The authors discuss not only delay analysis techniques, but also their appropriateness under given circumstances, demonstrating how combined approaches may be applied where necessary. They also consider problematic issues including ‘who owns the float’, concurrent delay, early completion programmes, and disruption. The book has been brought fully up to date, including references to the latest publications from the CIOB, AACEI and SCL, as well as current case law. Broad in scope, the book discusses the different delay analysis approaches likely to be encountered on national and international projects, and features practical worked examples and case studies demonstrating the techniques commonly used by experienced practitioners. This is an invaluable resource to programmers and schedulers, delay analysts, contractors, architects, engineers and surveyors. It will also be of interest to clients’ professional advisors managing extension of time or delay claims, as well as construction lawyers who require a better understanding of the underlying assumptions on which many quantitative delay analyses are based. Dr P John Keane, PhD, MSc, FCIOB, FCIArb DipArb has 35 years’ experience in the construction industry and is currently principal of a private consultancy practice. Following training as a quantity surveyor, he graduated into construction and commercial management practice, subsequently holding executive directorships within contracting and professional consulting firms. In the last 25 years John Keane specialised in the area of dispute resolution and has represented parties in arbitration, adjudication and mediation. He has extensive UK and international experience, particularly in the preparation and delivery of expert witness testimony with regard to delay and programming disputes. He is an experienced arbitrator, author, and speaker. He also lectures to undergraduate and post graduate students on construction law related topics. Anthony F. Caletka, PE, CFCC, CCM is a civil engineer with over 25 years' experience in construction project and programme management, particularly on large civil engineering projects within the energy, mining, power, and utility sectors, and is a principal in a multinational professional services firm. He establishes governance frameworks, contract strategies, project control systems and tools aligned with global best practice which in turn contribute to the avoidance and resolution of disputes. Tony is a recognised expert in critical path programming, forensic scheduling, earned value and risk management. He has extensive experience in the delivery of expert witness testimony and advising parties in all dispute resolution forums. He is a frequent speaker and lecturers to post graduate students on project management and forensic scheduling. He was a member of the drafting committee which produced the SCL Delay and Disruption Protocol.